MevaDec modular slab formwork system. 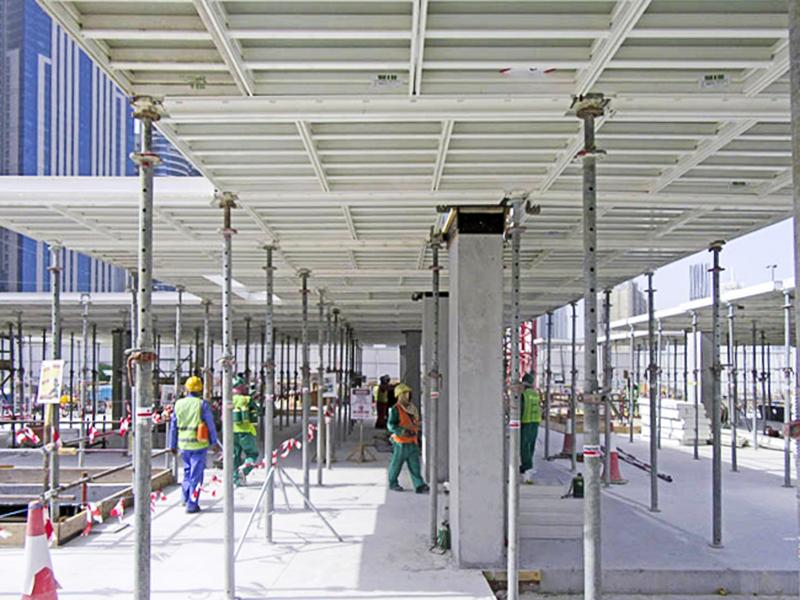 MevaDec modular formwork offers three forming methods, using the one system, for any suspended slab project. These include FTE, HN and the E method. 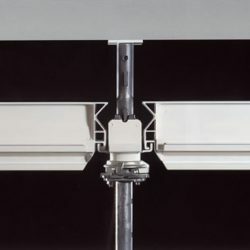 The drop head system enables early striking to be achieved, typically within 3-4 days (subject to engineer’s approval). 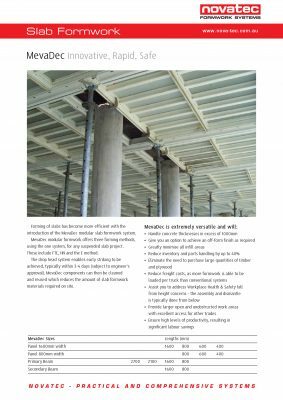 MevaDec components can then be cleaned and reused which reduces the amount of slab formwork materials required on site. Easily adapted to most floor plans. Achieve off-form finish (HN system). Greatly minimise all infill areas. 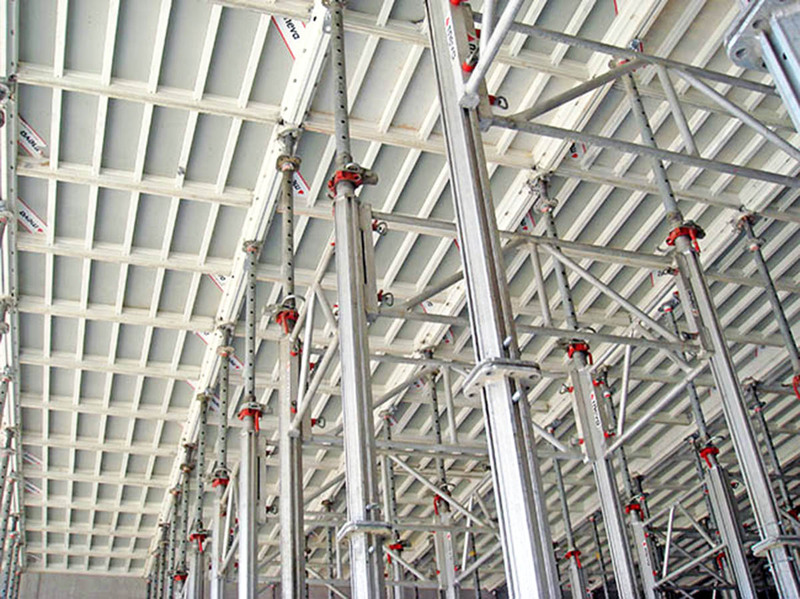 Reduce freight costs, as more formwork is able to be loaded per truck than conventional system. Eliminate the need to purchase large quantities of timber and plywood (small quantities still required to infill areas). Improve Workplace Health & Safety concerns, as erection is done from below. Ensure high levels of productivity, resulting in significant labour savings. 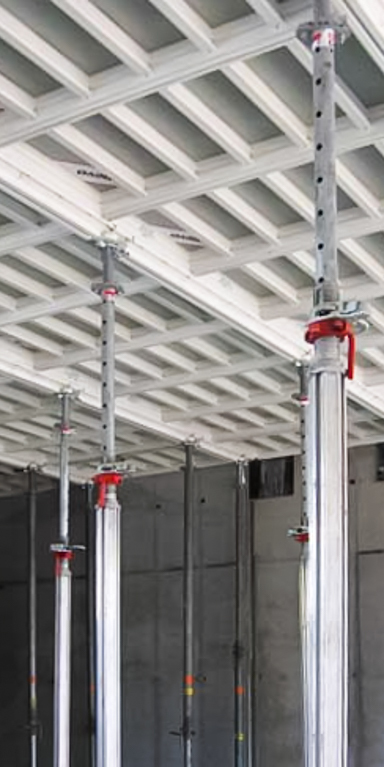 Reduce dependancy on craneage to lift materials off slab - all components are small enough and light enough to be transported up in a material hoist. 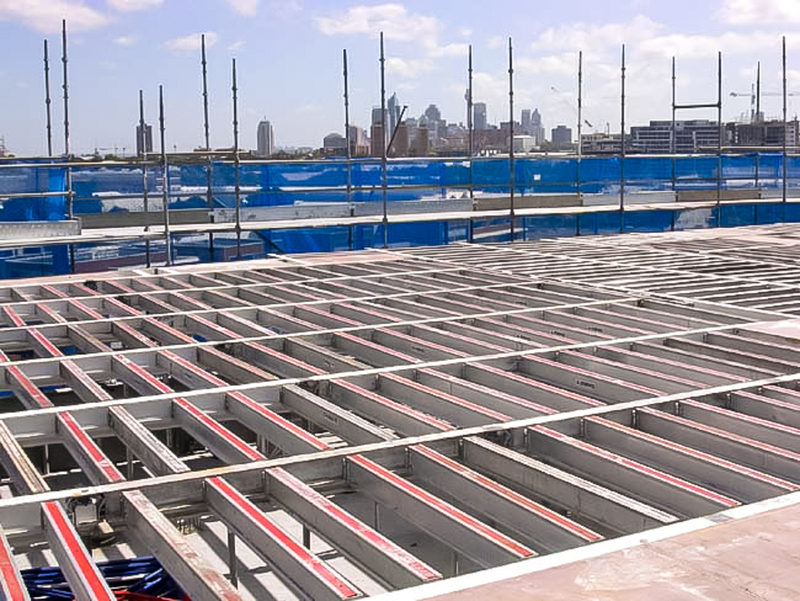 Provide larger clear unobstructed areas underneath formwork resulting in improved access for all trades. Handle concrete thicknesses of up to 1.0 mitres. 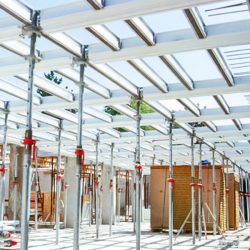 Primary and secondary beams are situated at the same level. They support the separate plywood or alkus shuttering. The use of drop heads permits early dismantling of the primary and secondary beams, which enables the props to remain behind undisturbed. This forming method can be applied to all floor layouts, even if the floor is not right angled, as the modular system adapts in both directions. This system can be utilised to achieve an off-form finish. 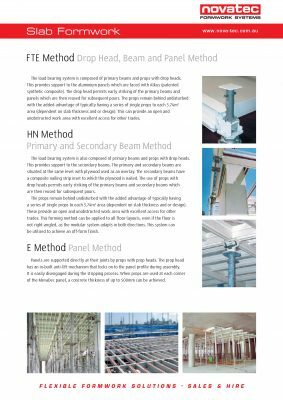 As with the primary and secondary beam method (HN), the load bearing system is composed of primary beams and drop heads. It supports the ready made panels which have either plywood or alkus as a form facing. The drop head permits the early striking of primary beams and panels. This method achieves a ‘patterned’ finish, due to the layout of panels, with very minimal deflection. If required skimming or patching can assist to ensure a higher class of exposed concrete. 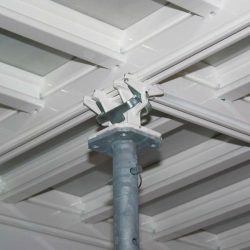 Panels are supported directly at their joints by prop heads – without beams, and whilst productivity levels can be very high, there is no undisturbed propping feature with this style of system. Props can be of lower capacity as spans and or loads are reduced accordingly.